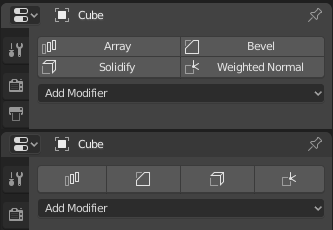 Shows buttons/icons with favorite modifiers on top of the Modifier Stack. Favorite modifiers stored in User Preferences, so use Preferences -> Save Preferences. Appreciate any feedback and pull requests! But Favorite Modifiers Add-on is great too. If anyone still interested, new version of this small add-on! From this version I decided to store favorite modifiers in User Preferences since it should not depend on scene and be everywhere the same. So, from now to save changes go to Preferences -> Save Preferences . Go to Preferences -> Add-ons -> Install… and select “Blender_2.8_Favorite_Modifiers_Add-on_v1.1.0.zip”.